Adventure and fun await you down at the Good News Zoo! Â 20-minute musical is perfect for preschool audiences and features four high-energy songs that will get kids singing and clapping along. 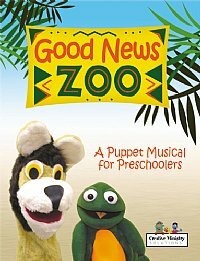 Join Hopper the Frog and Larry the Lion as they learn all about how Jesus is the King of the Jungle and how he wants to live inside our hearts. They also learn about staying away from that nasty guy... the devil. Two of the songs feature simple actions that kids will love doing along with the characters.